Disadvantages: Perhaps a Sd.Kfz. 221 or 223 vice two 222s? 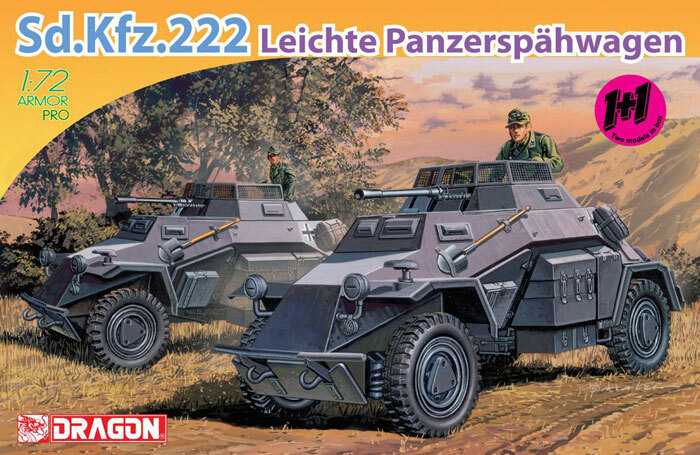 The German light armored cars have always been popular with modelers as they are compact, nicely balanced and just tend to look “right”. As a result, there have been numerous versions in 1/35 scale but not as many in 1/72, so any release of a kit of one of them is an event. DML is now offering a “1+1" kit which is two kits in one box, this time of the 222 variangt of the family. With nearly a thousand built it was the most widely distributed one of the group and was able to defend itself with a 2 cm cannon and 7.92mm coaxial machine gun. 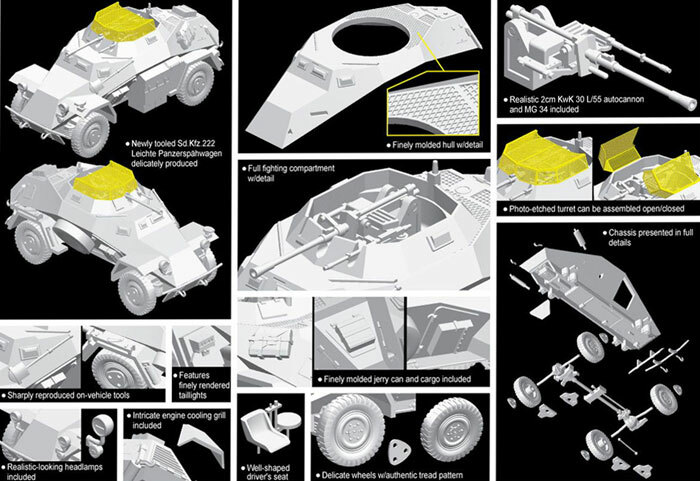 The kit comes on one sprue of parts and separate one-piece upper and lower hull sections. Two finishing options are offered, both in Panzer Grey: Unidentified Unit, France 1940 (black and white crosses) or Unidentified Unit, Poland 1939 (white crosses). Number plates are provided along with a number jungle, all from Cartograf. Overall this is a nicely done little kit but will take some work to create a really great model. For wargaming it’s great right out of the box.